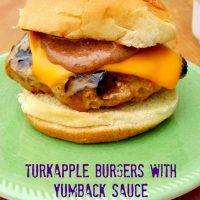 Turkapple Burgers with Yumback Sauce have ground turkey, apples, onions, and jalapenos topped with a delicious yumback sauce made with Blueberry White Pepper fruit ketchup. They’re flavor packed and perfect for Memorial Day! Holy crow, how did Memorial Day sneak up on me?? It’s like next weekend!! What the… Please tell me I’m not alone in this. I’m sure those with kids are saying the same thing, but I have no kids. At least not the two-legged kind that require school. It seems like just last week it was my birthday and Mom was here taking Sur La Table classes with me. And now it’s Memorial Day. Don’t blink or the next thing you know it’ll be Christmas next. Wash, rinse, repeat. Where does the time go?? Blogging! For me it’s work and blogging. I’ve started participating in holiday events with my blogging friends, then there’s the sharing groups and Freaky Friday events with another group of bloggers. I have been going through the motions of blogging just been really dragging my feet with it lately. I’m just so tired. I need to blog on the train the mornings like I used it. That’s two hours where I could get some work done. I also need to stop being lazy at home and make the recipes I plan and take the photos needed. Maybe I’ve hit my first slump? But I don’t blame the blogging for the slump. I blame the day job. Oh if only I could do this full time and make 6 figures like tomorrow I’d do that in a heart beat. But there’s a mortgage and bills that must be paid and, well, I don’t have 6 figure content right now. At least I don’t think so. But, after attending the Food Wine Conference this weekend, I have renewed spirits and motivation! I will CRUSH my Instagram!! I will embrace and nurture my brand. And finally, I WILL have pride in my name and not even consider changing it!! Are you grilling this weekend? Even if you don’t celebrate Memorial Day you can still grill this weekend. Unless you live on the other side of the globe where it’s winter. Then, I guess you use a grill pan? Yes. It’s a stretch. But I’m trying to make sure y’all get to have these delicious turkapple burgers this weekend or even next weekend. Okay. I’m sure you’re saying, “what in the world is yumback sauce?” So, I was looking for a burger sauce. Something unique and interesting to make with the Not Ketchup sauce. I kept seeing yum yum sauces and comeback sauces. So, I combined the best of the both worlds and made a delicious yumback sauce with the blueberry and white pepper Not Ketchup. Now, you don’t have to use the blueberry and white pepper Not Ketchup. There’s other fruit ketchups out there. I like ‘Chups. They’re fairly local to me and have great flavors. OR you can make your own. I believe blueberries are in season and a ketchup isn’t all that hard to make. Well, not that I’ve made one to speak from experience, but from what I’ve read they’re not hard. Yes. There are two kinds of cheese on this burger. The slice we put on while they were on the grill just melted into oblivion. You couldn’t see it. I should have learned what I know now from cheese and which ones look best I photos. So, I had to put another slice of cheese on the burger so you can see there was cheese on the burger. Because all burgers much have cheese on them. At least I think so. And that sweet and delicious yumback sauce is the perfect flavor to pair with the sweet, onion-y, and slightly spicy turkey burgers. I can hear Denise now about the bun. I’m bun challenged in photos. At least I have some good tips now. Stay tuned for the next burger recipe and check out THAT bun! What are you grilling up this weekend? 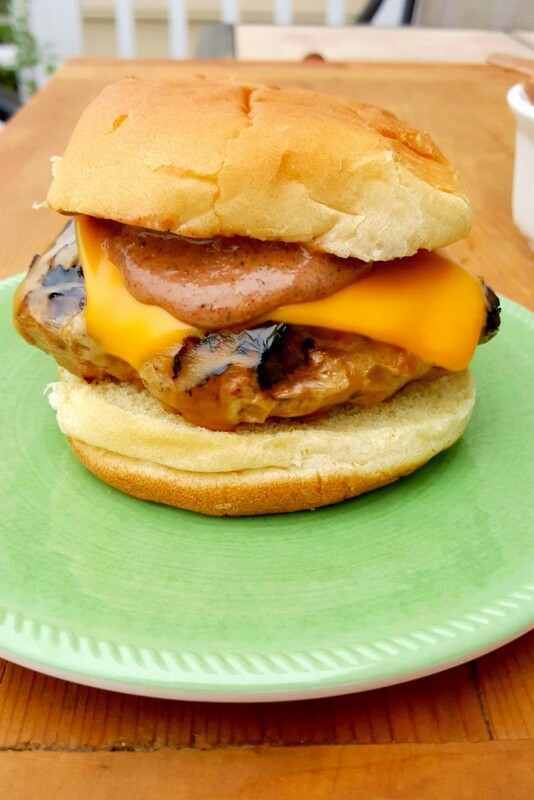 Turkapple Burgers with Not Ketchup Yumback Sauce are ground turkey burgers with apples, onions, and jalapenos topped with a delicious yumback sauce made with Blueberry White Pepper @NotKetchup. Combine the first 4 ingredients in a medium mixing bowl. Form into 4 patties and grill 2 minutes. Turn the patties 45 degrees and grill an additional 2 minutes. Carefully turn the patties over and grill 2 minutes, turn 45 degrees, and grill 2 more minutes or until cooked through an no longer pink in the middle. Remove from heat, top with cheese, and allow to rest while you make the sauce. Combine the next six ingredients (mayonnaise through white pepper) in a small mixing bowl with a whisk. Spread the sauce on the top and bottom of each of the four buns. Place a burger on each bun and top with the tomato and the onion. Serve with french fries and the remaining sauce for dipping your fries because you don't want to waste any of that deliciously yummy yumback sauce. Homemade “End of Season” Ketchup by What Smells So Good? I need to shake up our burger game and these are just the ticket! So yummy! Thank you! They are flavor packed. 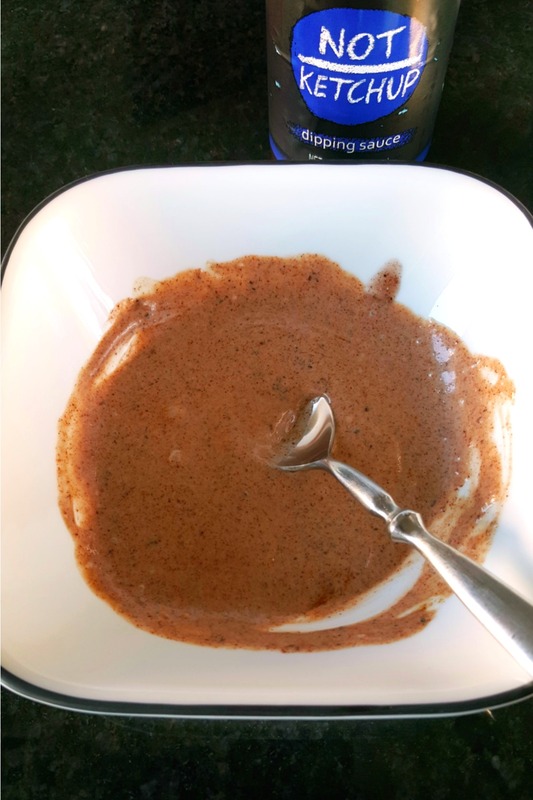 Your yumback sauce sounds delicious, along with the rest of your burger 🙂 Thanks for sharing your recipe on the National Hamburger Day Blog Party! Thank you for inviting me! The yumback sauce is addictive… just saying. Oh my!! How good are these?? It all sounds awesome….first the burger had some of my favorite things in it (that is jalapeños and apples) and then you throw in that intriguing Yumback sauce. And then I read about the blueberry Whitepepper Not Ketchup which I will now have to check out. Great recipe! Thank you! I love Not Ketchup. Erika is super sweet. I have ‘Chups near me and they have completely different flavors. Erika has a no sugar line coming out soon, too. YES! I had such a great time with you this year. I hope to see you again soon. Loving this combo. I’m up for turkey burgers but I need cheese on them too! I’m with ya! I had to put cheese on our chicken burgers tonight for dinner. A burger without cheese is just a patty on a bun. Not a burger. I’ve never heard of yumback sauce, but it sounds right up my ally! I made it up! It’s so good. We devoured that little bowl I made. We dipped fries in it and spread it on the burgers.